JC2-MP (also known as JCMP, JC-MP and JC2MP) is a project to bring multiplayer to Just Cause 2 in all of its magnificent glory. 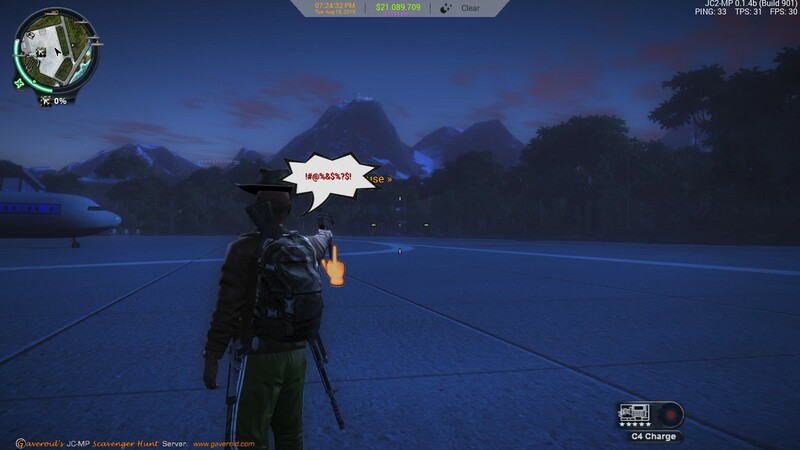 Imagine the chaos of normal Just Cause 2, then extending it out to dozens, hundreds, and even thousands of players. The official Gaveroid.com JC-MP Server has many things to offer. We have Advanced Factions with an easy to manage GUI and the ability to seize and control enemy faction bases and steal from their bank accounts. Find cash crates, win races, claim bounty rewards, win the lottery, destroy nuclear submarines, drift cars and hijack planes and boats to help build your wealth. Visit our custom locations, Gaveroid – Airport, House, Space Program, Broadcasting Company, lottery HQ, Pet Wall, Avatar Wall and the Nuclear Submarine Perak. We reward players by handing out cash and points (in-game only) bonuses for each day you play and extra bonuses the longer you spend online each session. We have a lot of mini games like Pong and Tetris that give out cash prizes if you beat the highest score. For your amusement we have added a lot of hidden “Easter Eggs” in to our server. From thieving snowmen to secret telephone booths, lots of fun and just plain annoying stuff for you to explore, discover and destroy. Which are also a part of our server achievements feature, you will be rewarded and gain bragging rights for each achievement you unlock. Press F5 once connected for a complete list of available gameplay add-ons. We recommend purchasing the DLC content for the best experience. If you do not own the content, you will not be able to see it or the players using it. 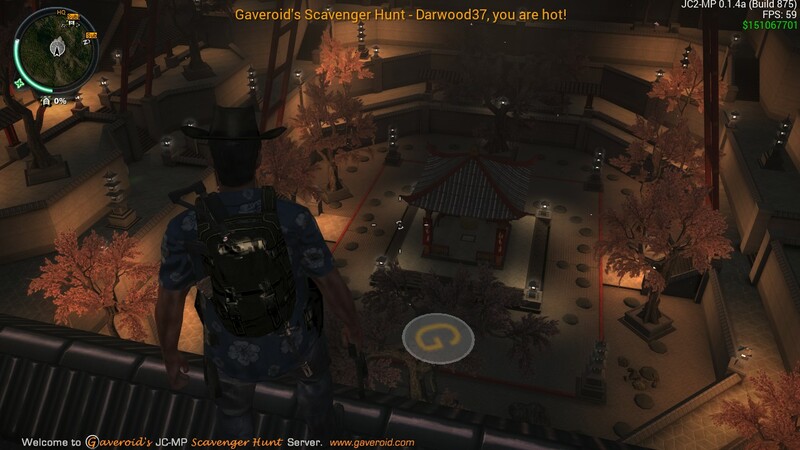 On Gaveroid’s JC-MP Server you can join Gaveroid’s Scavenger Hunt. 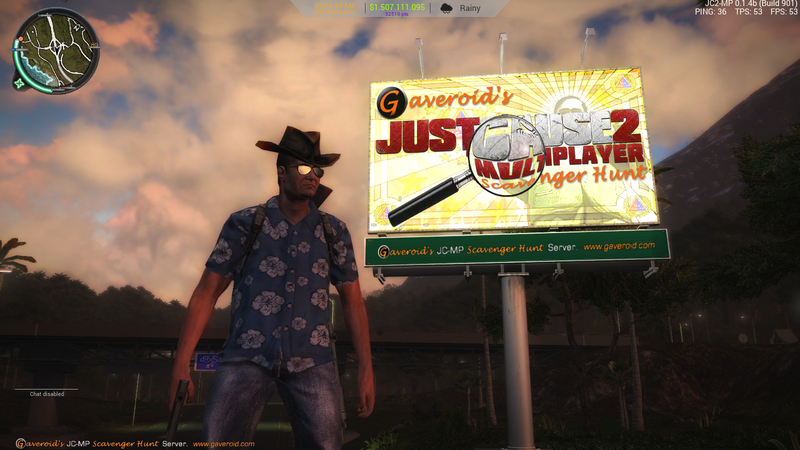 Travel around Panau and hunt for a large Gaveroid “G” logo on the ground. If you find it you can win actual PC game prizes. For a complete set of Scavenger Hunt game rules click here or scroll down to the bottom of this page. Click here to view our Steam online screenshot library. Join the Gaveroid Steam Group and receive exclusive content and perks when playing Just Cause 2 multiplayer on our server. Under vehicle neon lighting. Type /neon in chat to toggle on and off and to change the neon color. Access to the “Location Map”. 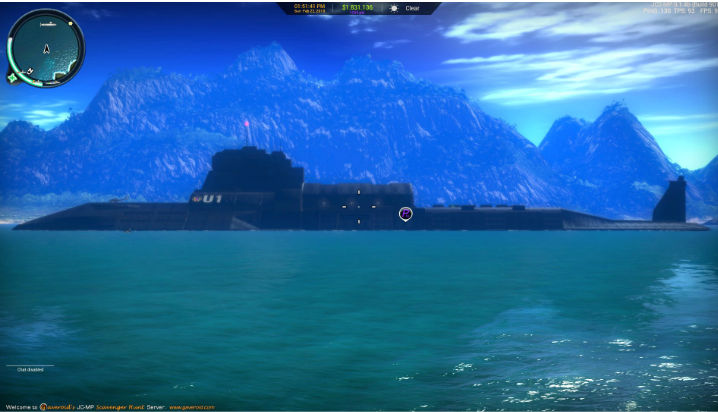 Press F2 to display a map showing all players, factions, nuclear sub locations and Gaveroid custom locations. Increased AFK time limit from 5 to 10 minutes until you are kicked from the server for being inactive. Higher dollar amounts found in the cash crates. Advanced notification of special server events, news and competitions. Increased pay day amount from $2000 to $2500. Increased bonus for every 15 minutes you are online from $250 to $325. Binoculars with night vision and laser rangefinder. type /bins in chat or press the 8 key. Gestures – taunt your fellow players with obscene gestures. Type the following in chat: /mf [optional-text], /tf [optional-text] or /wf [optional-text]. Longer grapple distance and super grapple bonuses. Wingsuit, double tap shift to activate. Jetpack. Type /jetpack in chat to toggle on and off. Added advantage (increased hints) to finding the hidden logo on our Scavenger Hunt. 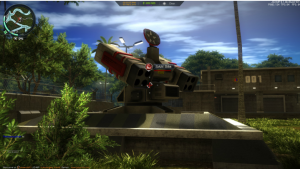 Access to Just Cause 2 Multiplayer Pong. Spectate view. Watch other players. 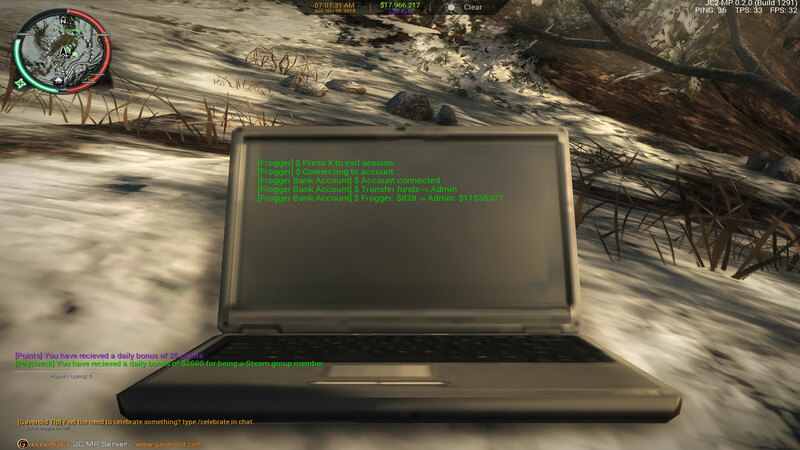 Type /spectate [playername] in chat. Unlock the Steam Group Member achievement. Chou view mode. Commonly know as Orbit. If you have any problems, while in-game hit F5 for help or chat with [Owner]Gaveroid, [Admin]Darwood37 or any [Admin] or [Mod], we will try to help you with your request or you can visit our forums at the link below. For a complete list of server rules click here or scroll down towards the bottom of this page. Please click the donate button to help support the “Cause” and contribute to the funding of this server. All donators will be given the “VIP” nametag status. Donating will not exclude you from being banned for breaking the rules. Donation amounts will dictate the time of you VIP status. $1 – 1 day, $5 – 2 weeks, $10 – 1 month, $25 – 4 months, $50 – 1 year, $100 – Lifetime. NO refunds. Respect the Owner, Administrators, Moderators, and other players. Do not argue with the Owner, Admins or Mods, more than likely doing so will get you banned. NO language except English in the global chat. Any other language is fine in PM or faction chat. NO soliciting. You cannot try to sell or promote anything on this server without prior consent from the Owner or an Administrator. This includes other game servers. NO Impersonating Gaveroid staff members or VIP’s, either by using a name and/or [Owner], [Admin] ,[Mod] or [VIP] tags. ***However, if you stumble across an “exploit”, you may receive compensation for your honesty IF the exploit is reported to a Mod or Admin within a reasonable span of time. Upon discovery, we know you may want to duplicate the exploit to help prove it to a Mod or Admin… feel free to do such… If within your testing it has an adverse result on a player and they oppose your actions, you may be banned. However, most likely, you will be sent to prison. There will be no escape, logout or of the like. You will however be compensated substantially less than if you reported the exploit ‘almost’ immediately or prior to harassing another player. Cash prizes are in-game currency only and not real money. 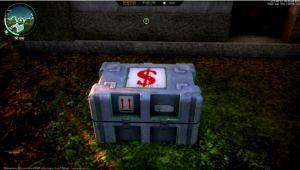 Cash is used for buying items in the game. Points are used for teleporting in the game. The terms cash and points only pertain to virtual items in the game world and no way shape or form represent anything in the real world. 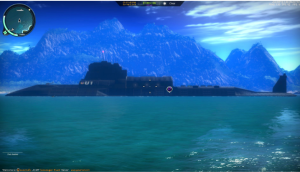 The above prizes can only be given to you when you are online, playing the game on our server. We will arrange a time with you so you can receive your prize. The above prizes are non-transferable, you cannot ask that we give them to another player, although you are free to do this yourself. We are not responsible if the game does not run on your computer. It is your responsibility to make sure it is compatible with your PC and that your PC meets the system requirements. We are not responsible for any errors whatsoever either by the game server, Steam, our website, or you. The game listed is what you will receive through Steam. You will not get credited in any other way for the value of the prize. You will not be able to exchange your prize for another. After you add the gift to your library, you cannot transfer it to another account or individual. 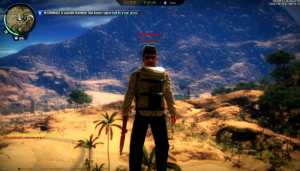 You must have a Steam account, The game Just Cause 2 and The Just Cause 2 Multiplayer mod. If you already own a copy of the game prize we will be unable to send you another copy as a gift through Steam so you are ineligible to win. The Scavenger Hunt is not open to Gaveroid system administrators or moderators, past or present. No purchase necessary. Please remember, just because you find the logo does not necessarily mean that you have won. The first person to find the logo and complete the instructions on how to claim the prize will win. 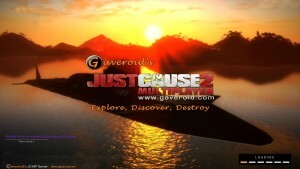 Just Cause 2 © 2010 Square Enix Ltd. JUST CAUSE and the JUST CAUSE 2 logo are trademarks , registered or not, of Square Enix Ltd. This website is not affiliated with Square Enix Ltd and Square Enix Ltd accepts no responsibility or liability for the content available. The views expressed herein are the sole responsibility of the website owner, administrators, moderators and it’s users.